It took me a long time to embrace sweet potatoes. I think I always viewed them as the regular potato’s orange-headed step sister. Sweet potatoes always seemed to be an excuse to eat marshmallows. Nothing more. But let me tell you, I have a sweet tooth that would put the Stay-Puft man in the witness protection program. I mean, c’mon. I’ve already made homemade marshmallows twice, and they never came in contact with the golden spud. Eventually, I’m not sure when exactly, I realized that a sweet potato is good on its own. No corn syrup. No sugar. No marshmallows. No casserole. Now, I love them roasted, fried, and even mashed. 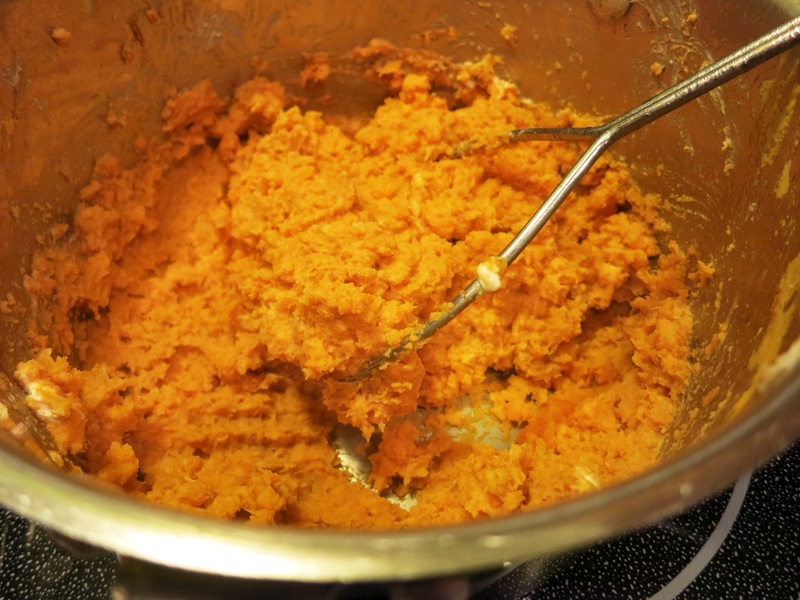 A sweet friend of mine, Annette, told me about a dish she once had that included sweet potatoes and horseradish. So that got me thinking. 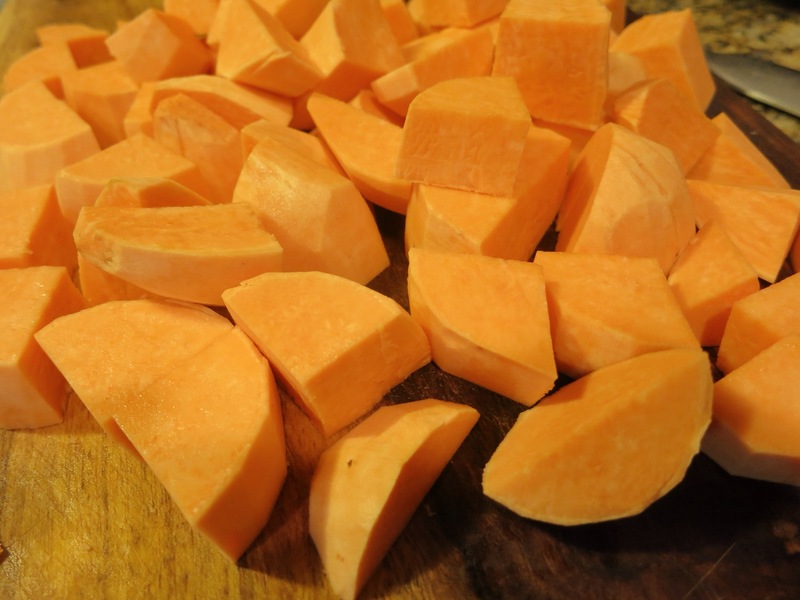 When I roast sweet potato chunks, slices or spears I usually dust them with cinnamon, salt, and cayenne pepper. You need something to offset the natural candy quality. So why wouldn’t horseradish work? Well, I didn’t have horseradish proper, so I improvised. I used Sriracha, the wonderful sauce made from Thai chiles and garlic. It should be the new ketchup. Heinz, you’re missing out here. Seriously. 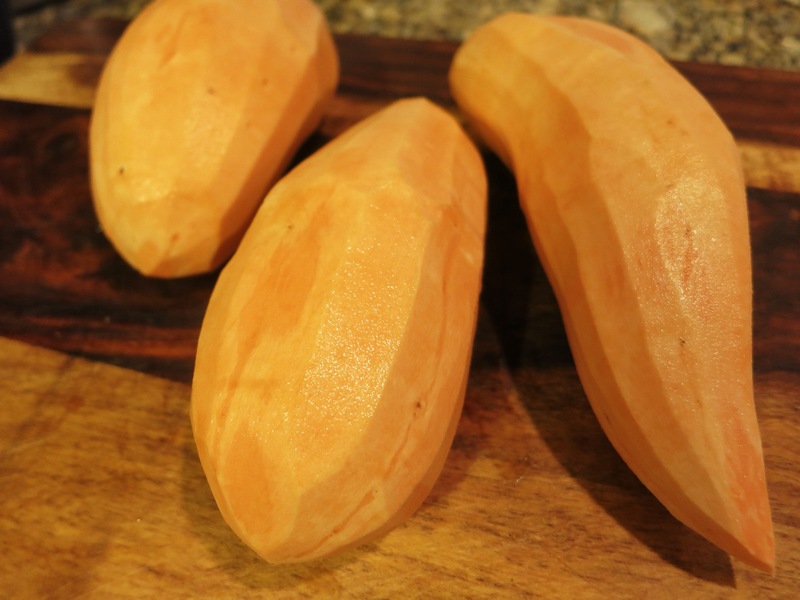 Scrub and peel the sweet potatoes. Cut them into equal-sized chunks. This ensures that they’ll cook evenly. 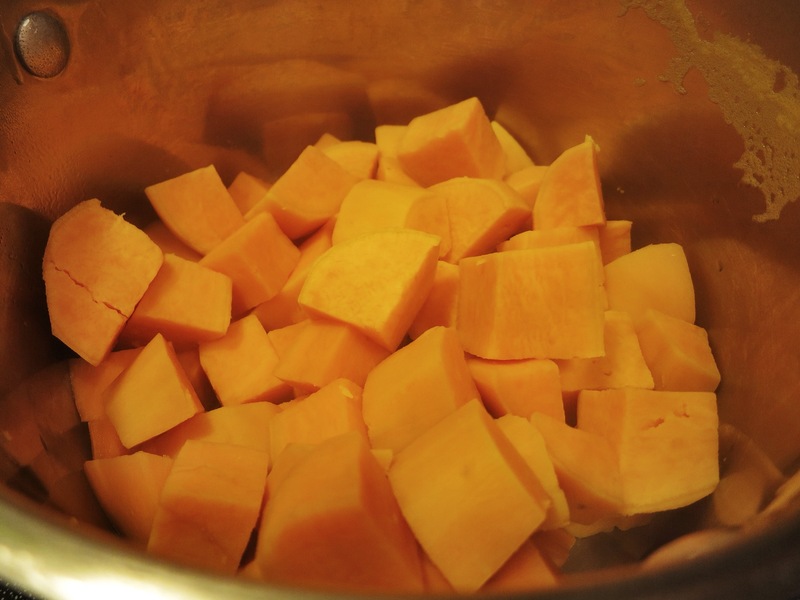 Put the chunks into a medium-sized pot and add enough water to cover the potatoes by two inches. Bring the water to a boil and cook till the potatoes are tender, about 20 minutes. Use a knife to pierce the potatoes at the 15 minute mark to check doneness. If the knife goes in and out easily, they’re ready. Drain the potatoes, then return them to the same pot. Add the cream cheese, the butter, the cinnamon, the Sriracha, a few pinches of salt, and a crack of black pepper. Now, mash the crap out of everything. The butter and cream cheese will melt into the hot potatoes as you smash them into next week. Take out your aggression here. Who needs the gym? You want the mixture to be smooth and creamy. The color is incredible and so is the scent. It’s warm, but your nose gets a slight tickle from the spicy Sriracha. 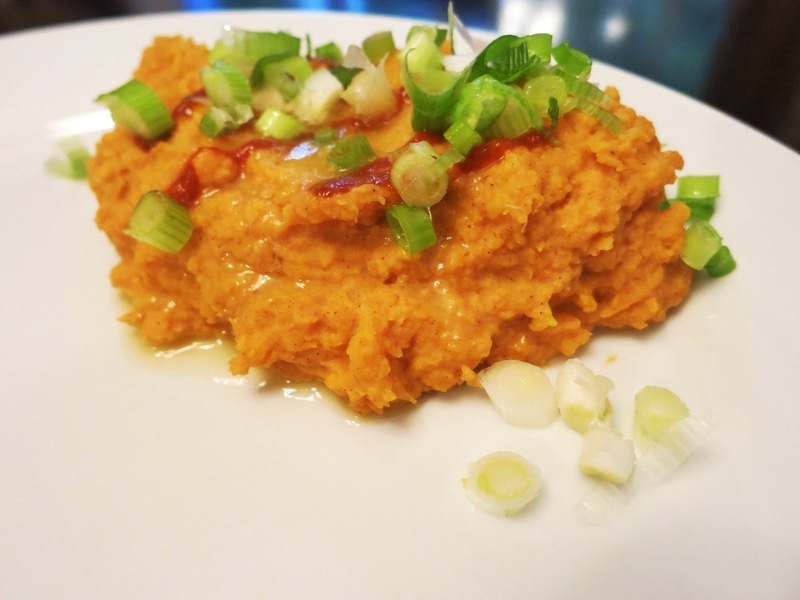 Serve the mashed sweet potatoes topped with a smidgen of butter, a drizzle of Sriracha, and a sprinkling of green onion. If you’re not a fan of spicy food, skip the extra Sriracha. The mash itself isn’t overly hot. The whipped cream cheese makes this mound as light as a feather. You get the usual sweet potato casserole warmth from the cinnamon (look at the specks of the spice! ), followed by an unexpected kick in the roof of the mouth from the hot sauce. The scallions are a real treat, giving you a slight bite, a nice bit of brightness, and some much-needed crunch. This batch should serve 4-6 people depending on the portion size. My partner in cuisine crime and I got 4 servings. What? We’re hungry boys. You could double or even triple the recipe and serve it in a casserole dish or big bowl. It would be a perfect pass-around-the-table side dish for the holidays. If anything, this is just a pretty dish. Orange, green, red… Hello, Fall! 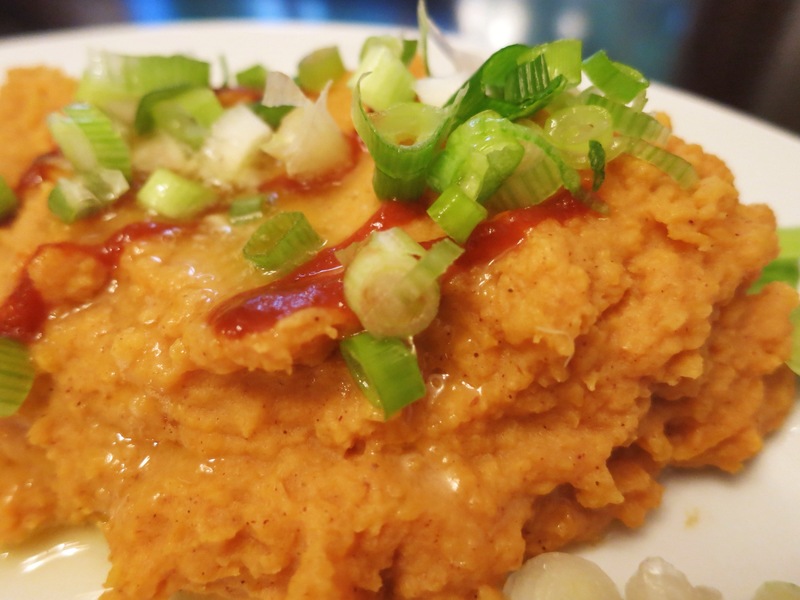 Tip: Along with the drizzle of Sriracha and the green onions, try topping the mashed sweet potatoes with crumbled crispy bacon.